A big part of Sam Farha's image is the unlit cigarette that often sticks out of his mouth. 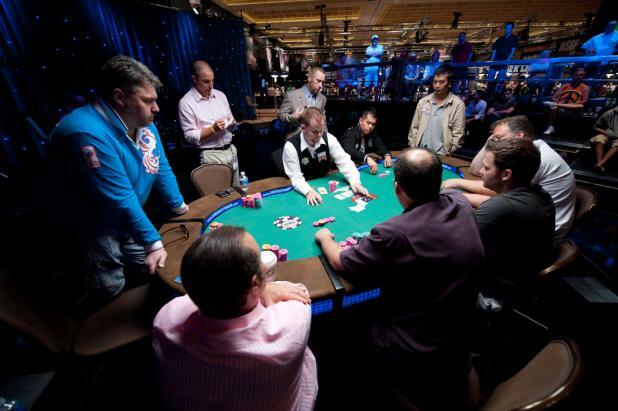 Like it or not, smokelit back rooms were a big part of poker's image before the modern televised era. 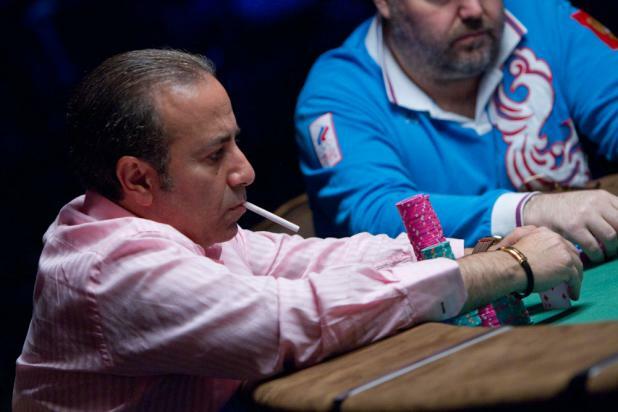 Since smoking isn't allowed in most poker tournaments (something even most smokers are grateful for), Farha's unlit cigarette is often the lone indicator of what things were like in a previous era. There was one four-way pot right after another at the final table of Event #25 ($10,000 Omaha Hi-Lo). This time, it didn't work out as well for the short-stacked player. Tony Merksick was all in on the turn with the board showing Kc-10c-7s-6h, later revealing he had a pair of sixes with an ace-high flush draw and a low draw. But the river card paired the board with the 6s, killing any possible lows, and Yueqi "Rich" Zhu won the hand with K-K-J-J (kings full of sixes). 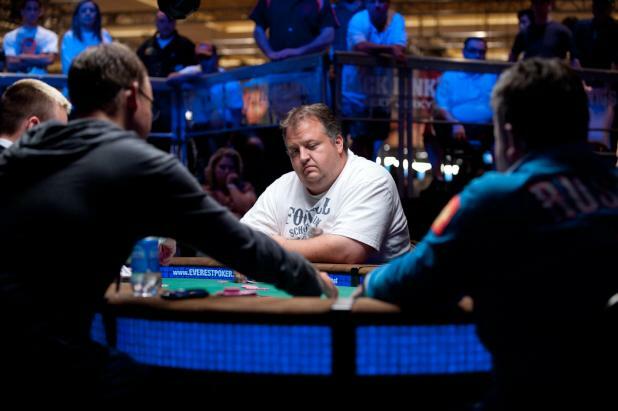 Tony Merksick was eliminated in fifth place, earning $128,097. With five players left in Event #25 ($10,000 Omaha Hi-Lo), a huge pot developed between four of them: Sam Farha (seated, left), Sergey Altbregin (center), James Dempsey (next to the dealer), and Yueqi "Rich" Zhu (foreground). On a board of Jc-8s-3h-2d-5c, Altbregin was all in on the flop, and Farha bet both the turn and the river. After Dempsey called the last bet, Zhu said, "Since you called, I'm folding," and flashed two of his cards -- pocket aces. Farha and Dempsey split the side pot (Farha took high, Dempsey took low), while Altbregin showed As-9s-7c-4c to scoop the main pot (worth 1.2 million) with a wheel straight (ace to five). With five players remaining in Event #25 ($10,000 Omaha Hi-Lo), Sergey Altbregin (center) is all in against three other players after a flop of Jc-8s-3h. If Altbregin can scoop the main pot, he'll quadruple his short stack into an average stack of 1.2 million. 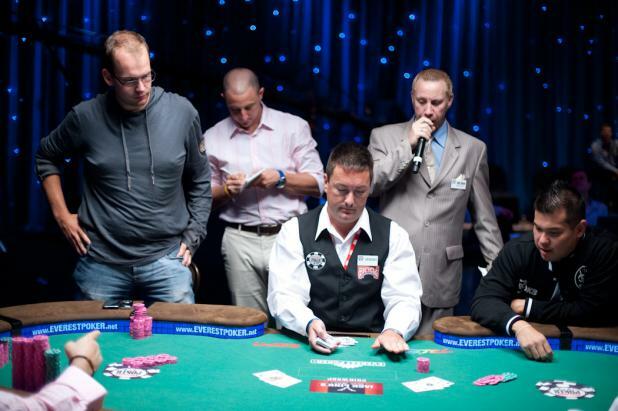 Altbregin can do nothing but wait while Sam Farha (left), Yueqi "Rich" Zhu (foreground, right) and James Dempsey (not pictured) continue betting into a side pot. 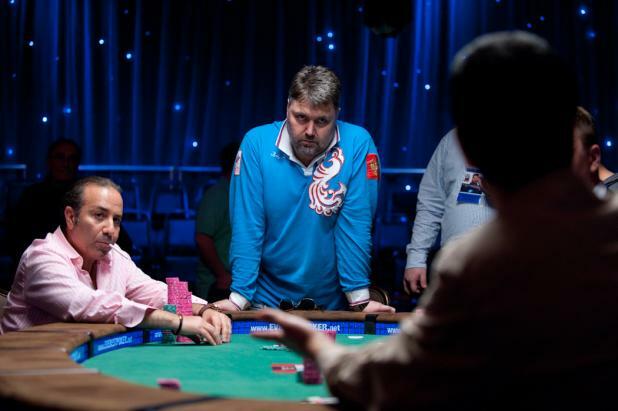 Sam Farha is one of the most iconic figures in the televised poker era, and it all dates back to his heads-up match against Chris Moneymaker in the 2003 WSOP Main Event. Farha seemed to sniff out a bluff from Moneymaker, but couldn't find it in himself to call. Farha folded, and the rest, as they say, is history. 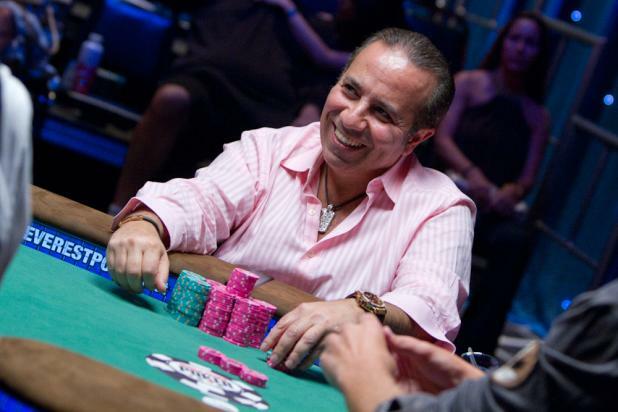 Farha remains popular among fans with his appearances on "High-Stakes Poker" and other TV shows, though he doesn't pursue tournament success the way most players do, and only plays tournaments when the mood suits him. However, Farha loves to win, and he already has two bracelets (1996 and 2006) in Omaha events. Michael Chow (right) is all in preflop against James "Flushy" Dempsey (left) at the final table of Event #25 ($10,000 Omaha Hi-Lo). Both players have already won bracelets at this year's WSOP, and are both looking to become the first multi-bracelet winner of the year. (Chow won Event #4, $1,500 Omaha Hi-Lo, and Dempsey won Event #9, $1,500 Pot-Limit Hold'em.) Unfortunately for Chow, this would be his last hand, as his As-7d-6s-4h couldn't catch up to Dempsey's Ah-Ks-5h-2c. 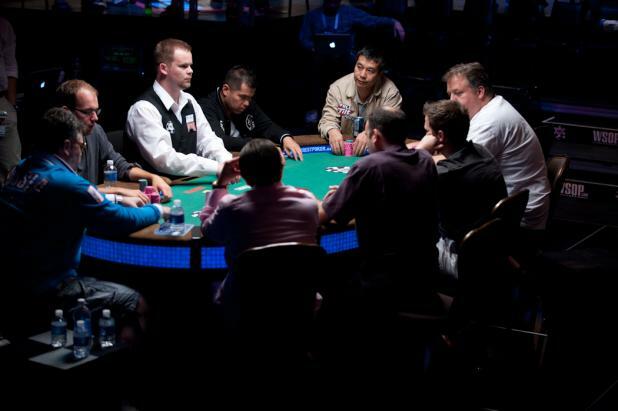 Chow was eliminated in sixth place, while Dempsey continued playing with hopes of winning his second bracelet. Eugene Katchalov is all in and facing elimination in Event #25 ($10,000 Omaha Hi-Lo), but manages to win enough of the pot to stay alive. 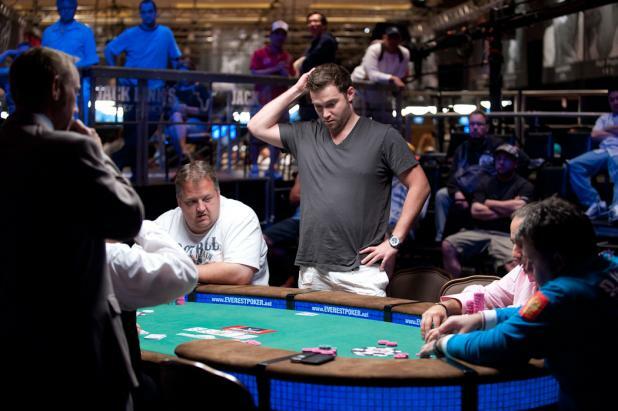 While Katchalov has a WPT title to his credit, he is still looking for his first WSOP bracelet. Unfortunately, he wouldn't win it on this night, as he was eventually eliminated in seventh place. A big hand plays out with eight players remaining in Event #25 ($10,000 Omaha Hi-Lo). 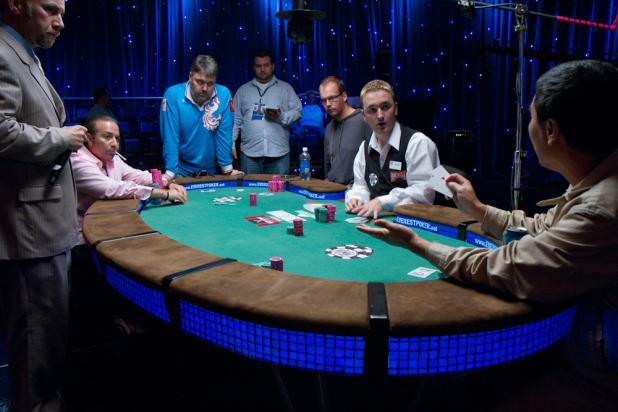 The final table of Event #25 ($10,000 Omaha Hi-Lo) is played out on the ESPN stage, but without the ESPN crew. The players, in clockwise order from the dealer: (1) Michael Chow, (2) Yueqi "Rich" Zhu, (3) Steve Wong (not pictured), (4) Tony Merksick, (5) Eugene Katchalov, (6) Abe Mosseri, (7) Sam Farha, (8) Sergey Altbregin, and (9) James Dempsey. The "bubble boy" for the final table was 10th-place finisher Mike Sexton, who was inducted into the Poker Hall of Fame last year. After winning his first WSOP bracelet in Event #19 ($10,000 2-7 No-Limit Draw), David "Bakes" Baker said, "This is the ultimate poker achievement. It's a great feeling. There is not really anything better than this, except multiple gold bracelets. No one can now say, 'Well, what have you won' anymore. … Now, when I say I'm a professional poker player, it has real meaning. 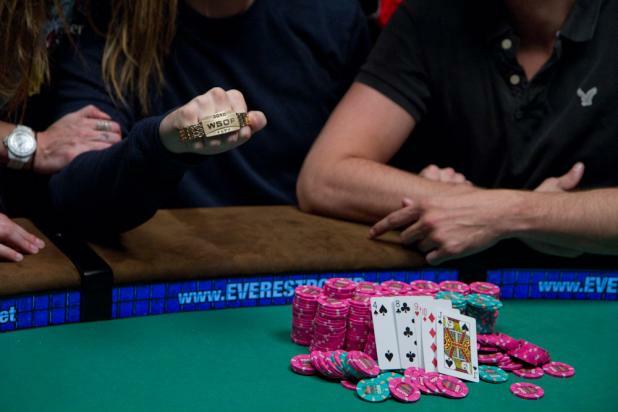 The WSOP gold bracelet gives real meaning to claiming you are a poker pro."